instead of pyramids scattered around the mile-and-a-half-long site you'll find hotels poking through the mangroves -- five of them, with over 2,700 rooms -- and instead of a ceremonial hut there's a convention center. Also a disco. Wandering around paths through the jungles of the huge Barcelo resort on eastern Mexico's Riviera Maya you get an idea of what it must have been like in the Mayan cities that once flourished in this area. Only instead of pyramids scattered around the mile-and-a-half-long site you'll find hotels poking through the mangroves -- five of them, with over 2,700 rooms -- and instead of a ceremonial hut there's a convention center. Also a disco. Still, the ambiance of an old-time village comes across in dozens of palapa-style buildings on the site and the liberal sprinkling of statues of Mayan kings, gods and goddesses. Mayan characters and figures are used in directions to the resort's 24 restaurants, 21 bars and three theaters and even for the restroom signs. Young guests check out the Mayan alphabet. 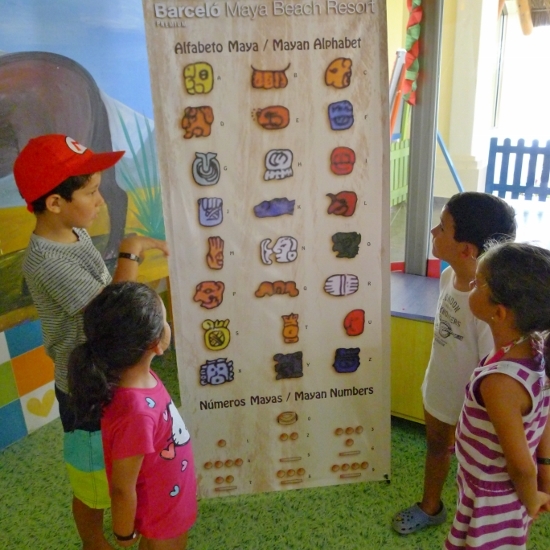 In the resort's Kids Club, youngsters learn some key glyphs in the Mayan alphabet and a smattering of Mayan expressions, like malakeen (meaning hello) and mishabel (how are you? ), words often repeated by the kids to the delight of the many Mayan staffers among the resort's 3,000 employees. An immense tile mural of the great Mayan snake god Kukulcan greets guests checking in at the 757-suite Barcelo Maya Palace Deluxe at the high end of the resort's five hotels. All five units are all-inclusive (which means you can eat and drink as much as you can hold during your stay, and it's all included in a flat rate for your room). 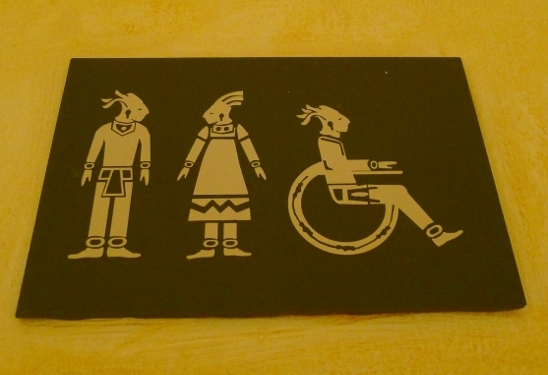 Restroom signs use Mayan figures. Developers of the resort did their best to leave much of its grounds untouched, including a good portion of the mangrove forests, palms and tropical flowers peppering the area, long ago known as Xpu-Ha (eesh-poo-hah). "We adapted the resort to the place," explains Ana Chavez, marketing manager for Barcelo's hotel-resorts in Mexico. Xpu-Ha, she noted, means something like "the place where the waters are born," referring to a number of streams winding through the grounds. Chavez said small villages likely dotted the waterways here and there. Several palapa-style buildings dot the resort. No ruins were found on the Barcelo property, but guests at the hotel and at hundreds of other properties on the Riviera Maya can book tours to several major archaeological sites in the region. Among the most-visited ruins are those at the coastal city of Tulum at the southern end of the Riviera and at the inland sites at Coba and Chichen Itza. 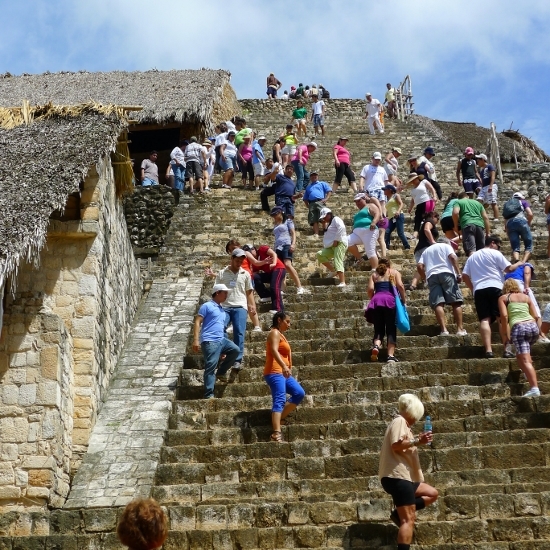 Ek' Balam, until now a lesser known site, is fast becoming a popular stop on the tour circuit. Located a few hours inland from the Riviera, the ruins of Ek' Balam (meaning either "black jaguar" or "star jaguar") date back to 300 B.C. and once spread out over an area of 7 square miles. What's been excavated of the city so far offers tourists a chance to explore 45 stone structures, the largest of which is a soaring pyramid called "the Acropolis." Visitors who climb the structure's 106 steps are rewarded by a spectacular view of the rest of the city and its surrounding area. Tourists on the main pyramid at Ek' Balam. Officials at the Barcelo and other hotels on the Riviera are bracing for ongoing hikes in what they've tagged "apocalypse tourism" as the weeks roll by to Dec. 21, the last day of the 13th and last baktun (cycle) of the 5,126-year Mayan calendar. Historians generally scoff at an end-of-the-world scenario, however. "Doomsday predictions make great copy," says Mayan expert Jaime Capulli in Mexico City," but most likely the old-time calendar-makers simply never expected anyone to be around all those years later - and just didn't bother to add another cycle." 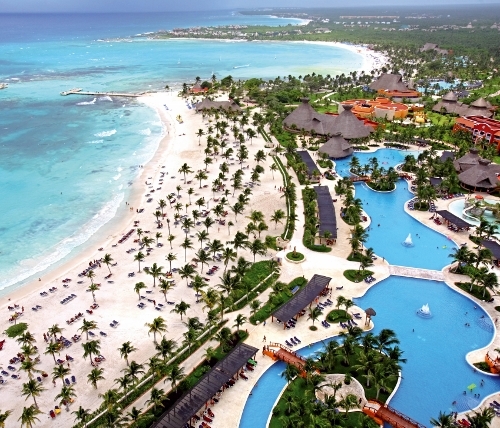 Aerial image courtesy of Barcelo Hotels. All other images by Bob Schulman.